Cucumbers are the classic "pickle" and can be found in hundreds of varieties. Some of the most common are pickle chips, bread and butter, dill, and pickle spears. The steps below are for making vinegar or "quick" pickles. We also have a recipe at the bottom for fermented pickles. Make sure you pick cucumbers that are crisp, fresh, and look free of mold or spots. Using "pickling cucumbers" can also result in a crisper pickle than using slicing ones. Larger cucumbers can be sliced into halves, strips, or rounds while smaller cucumbers are often left just the way they are. Pickling cucumbers uses a similar process as pickling cucumbers. Start by washing and peeling the cucumbers then discard any limp or discolored cucumbers. Next, prepare the cucumbers as you like. You can pickle cucumbers whole, in strips, or in rounds. Some people like to soak the cucumbers in cold water, and other people prefer to salt them at this point. These steps are all optional depending on your preferences. Once you've prepared the cucumbers and any additional ingredients you will be adding such as onion, garlic, or herbs, add them to jars. 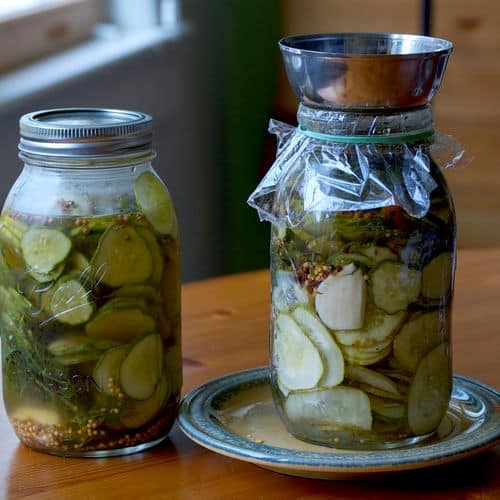 Remove the pickling solution from the heat and pour it into the jars filled with cucumbers. Leave about 1/2" at the top of the jar. Seal the jars. If you are canning the cucumbers you now process the jars in a water bath for 15 to 30 minutes, depending on the size of the jars. Once the jars are processed they can be stored in the cabinet for up to a year. 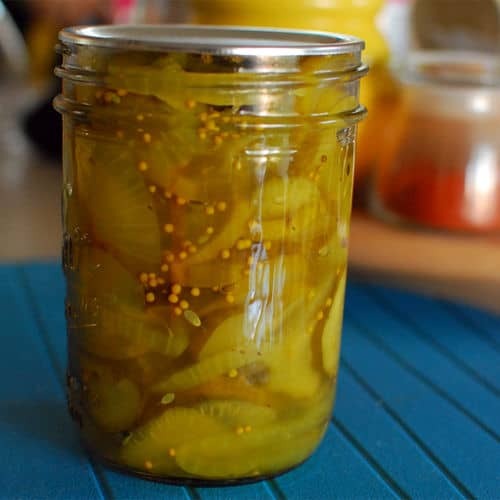 The pickled cucumbers will typically be ready to eat after a day but the longer they remain in the liquid the more flavorful they will become.